This Super Light Folding Transport Chair with Carry Bag by Drive Medical has a lightweight, silver aluminum frame and maintenance free composite wheels with rear wheel locks. Weighing only 19 lbs., this transport chair is one of the lightest in the market. It folds like a conventional folding chair and comes with a carry bag for easy storage and transportation. 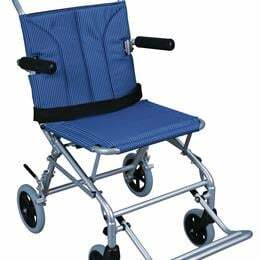 Comes standard with padded flip back arms, composite, maintenance free wheels that provide a smooth ride over most surfaces, fold down footrests and rear wheel locks ensuring a convenient, comfortable and safe transport chair. Product Weight: 19 lbs. .